First the pretty- I made a purse for a friend. Jennifer doesn't sew or quilt and HATES going into quilt shops because she says she feels like an imposter. (Probably feels like I did the day I had to go into a Junior League meeting to pick something up- 50 beautiful young women in power suits and I was in my work jeans, sneakers and a t-shirt.... lol, I wanted to crawl under a linen-draped table!) Anyway, Jennifer sucked it up and went to her LQS and picked out the fabrics and sent them to me. LOVED them, so pretty and spring/summery! 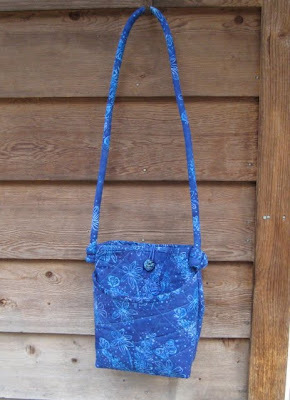 This purse is from my original pattern, The Parker Purse, only it's a bit bigger than what I usually make. Jen hauls more stuff around than I do, but I'm starting to find my little ones just a bit too little, so I make myself one like this. Anyhoo- a batik for the exterior and a Jane Sassaman pink and blue dot for the interior. I gave her a cool, iridescent glass button for the closure, too. Then the home repair- all of a sudden our electric bill jumped up by about $40 a month! What the heck!? So we thought- maybe it was the water heater. We did an experiment by shutting it down for 22 hours to see what it did to our meter reading and it was a big difference. So that meant our water heater was running too much. 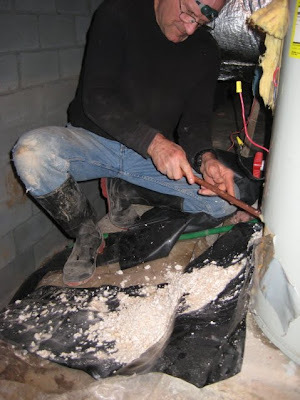 Jim got all his big tools out and spent about 2 hours trying to get the element out of the bottom of the water heater, under the house in the crawl space. I'm really proud of him, I would have been screaming obscenities by this point but he had a smile for the camera. Just behind him in the first photo, the ground drops away and there's a ditch about 4 feet deep. (That's where we're heading in case of a tornado!) The garage is on the other side of that wall. Anyway, not much room for him to work in. He ended up having to cut a bigger hole so he could get the pipe wrench in there, that element did not want to come out. It was to the point where I was about to go shopping online for a water heater to replace this 20 year old one. He finally was able to unscrew it and pull the thing out, though and then the built up lime and calcium/hard water deposits started pouring out with the water. He got his little copper tool and started scraping, while I watched. Usually the scraping is my job, don't why I escaped this time, but I was happy to squat there and ooh and aah over the massive quantity of it all! We have really hard water here. He scraped out about 10 pounds of this crap. No wonder the heater was working so hard, the element was buried in it! We're going to do this once a year, now, instead of waiting for an element to go bad. Well.... we SAY we'll do it, but it's such a crappy job and it's so hard to get the elements out, we'll probably wait as long as we can. Procrastinators Unite! So here's how we spent our Monday afternoon. I hope our next electric bill is much lower. The bag is cute but yuck on the rest of the stuff... Hope your new one works out! 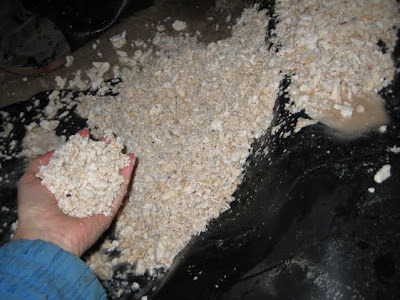 You can flush out some of the non-attached crud by flushing the water heater too?...we have lots of minerals in the water here... whites eventually become yellow! 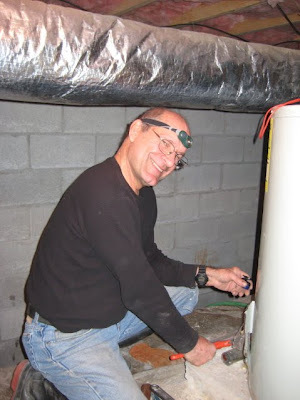 I love the pics of Jim fixing the water heater. And see, you are smart cause you've learned to ohh and ahh and take pictures of the man while he's doing the grunt work! Very clever. LOL So sad, all that "lime" and no margaritas......:) Soooo, do you have hot water now? Looks like quite a chore and I can picture it going very wrong...at least around my house! I have really soft water - it's the beautiful Scottish rocks round here, y'know. So the hard water in London was a shock when I lived there! I love how 5 minute jobs become 15 hour jobs (at least in our house they always do.) Kudos to the Man (capital M!) for his smile - mine woul;d have been growling big time by then!!! 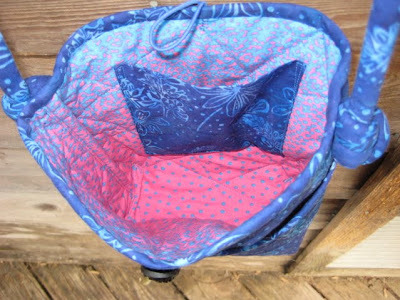 Very cool bag (a purse is what you put your coins in!!) - you are such a talented lady. The button is perfect for the bag! I can't believe all the build up in the water heater! That is incredible! Nothing like that up our way. I love the bag!! I have a vision of those bags in your Esty shop...I'm just sayin'. I have really hard water out here too. I had a new water heater put in a few months ago and when the guy drained it he couldn't believe all the gunk that came out. No wonder my hair and eyebrows are a bright purple...just kidding. Did you say something about TORNADOS??? Yikes, that word scares me. I hope you never have to use it girlfriend. In fact I heard on the radio last night that there were "whirly clouds" in Arkansas. I hope no where near you. That is an amazing amount of crap on the element of the heater. We have soft water here. Living in the US was my first experience with hard water - it was a pain! Love the purse....sure is some pretty fabric and a gorgeous button!!! Wow what a drama with the element , I hope that lowers your bill now . I love the bag you made , lovely colours ! Seriously, here we call purses bags and wallets empty! Hey - we replaced both elements and a thermastat on our water heater in October 2009 for the very same reasons! Way to go on doing the work yourself and keeping the same old "tub" for the water (we get dissed around here for all our home repair DIY projects). Oh, and love the bag too! Just acquired an Egg-cetera like yours but can't figure out how you would hard boil an egg in this without burning it. Anon- you can hard cook the egg in the shell on the metal base, pierce the egg first using the pointy thing and then put the egg, large end up, in the metal rack, after adding water from a measuring cup to "hard" fill mark. Put the top on, then plug the unit in. When it shuts off and the light comes on, they're done. For soft or medium, use the other marks. Enjoy your egg-cetera! You did an awesome job with the bag right there! I love how you've used that glass button for a closure. It blends in the design really well! About the home repair: 10 pounds?! Now that's a lot of unwanted elements in your water heater. No wonder you've decided to do this annually from now on. I just can't have anything nice anymore!